You know, not only is it 1/1/11, it's also the year of the rabbit. Anne, this year is undoubtedly looking quite promising for you! As for the rest of us, i have no idea what it means, but let's hope for good fortune and lots of blog hopping (couldn't resist)! 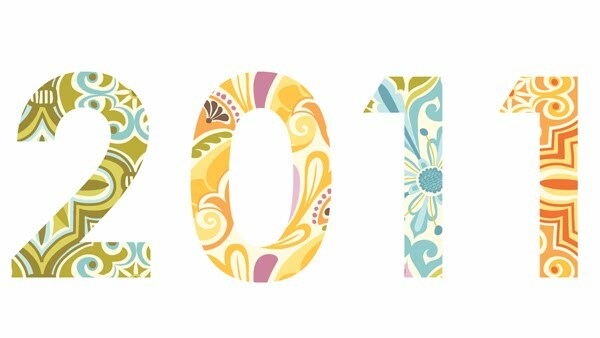 Wishing you all the very best for a year filled with many creative adventures, much happiness, good health, and abundant love. 'Flurry' is in the Forecast! Hope everyone had a wonderful Christmas! We sure enjoyed spending time with our families and sharing yummy food and lots of laughs with everyone. Now it's time to pull on those new socks, wrap up in that new scarf, throw on that new sweater...and get outside to shovel! What a pile of snow we've gotten here in the past couple days. 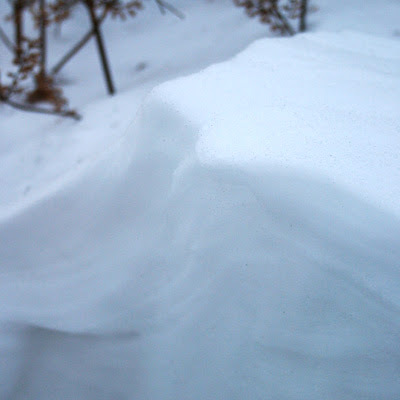 It's really beautiful and picturesque and our backyard has been transformed into an arctic scene with meringue-like snowdrifts holding soft peaks along the contours of our garden. Uh, but the downside of the snow/wind is that our flight was cancelled (insert lots of bleeps here). Yes, the one that was supposed to whisk us off on our tropical vacation! So, we spent the better part of yesterday on hold with various airlines (insert more bleeps), but were lucky to have been able to rearrange our plans so we'll leave on Saturday instead (thank goodness!). and i absolutely can't wait for you to see it in person! 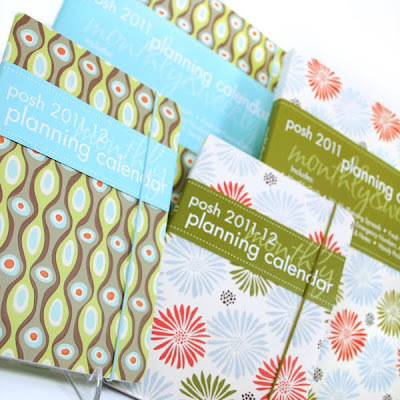 It will be going out on the road with the Moda sales reps soon (though i think some of you may have seen it already?).. I'll share more about the inspiration for the line and show you a few of the prints...very soon! 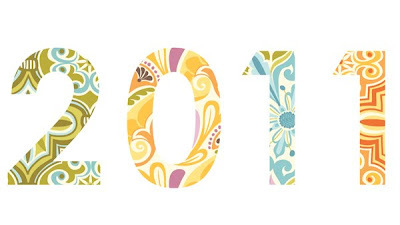 Before looking ahead, i always find it comforting to reflect on the year gone by and to take notice of all the events that have occurred — both small and significant. I find there is so much to value by recognizing the challenges we have overcome, or how we managed to navigate through uncertainty, or take hold of moments we wish to cherish. I always see things i would have done differently if i knew then what i know now (been there?). But rather than be regretful or critical of some of the choices i made, i'm grateful to have learned something and to have grown as a person. I'm hopeful that i might be guided by this new awareness to steer things a little better in the future, and am optimistic about the promise of a brand-sparkling-new year ahead. On quite another note, Pete and i have not had a week-long vacation in over two years! So right after Christmas, we're punching-out, signing-off, and logging-out to recharge and re-energize our selves (believe me when i say we need it). 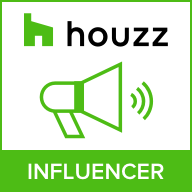 In case you're interested, we'll be staying in a tent-on-stilts at a tropical eco-resort where we'll have to carry our own water, will only have a two-burner propane stove to cook on, and solar showers! Should be lots of fun and quite an adventure. Will share some photos when we get back! Wishing you all the very best for a Merry-filled Christmas and a Happy-full New Year too! She had mentioned the idea of adding a small bit of stuffing to the backside before finishing it to give it a little dimension and pouf...so that's what i did! 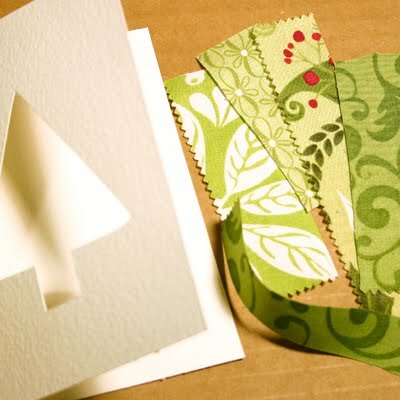 You can probably already figure out how to make these, but here are some step-by-step instructions if you'd like them. heavy card stock paper — i used textured watercolor paper that was precut to postcard size, 5"x7". If the paper is not precut, you'll need to cut it to 5"x7" (or whatever size you'd like). 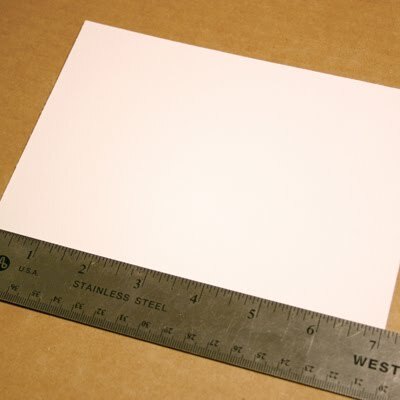 We'll be folding this in half, so make sure your dimensions correspond to the size you'd like when the paper is folded. 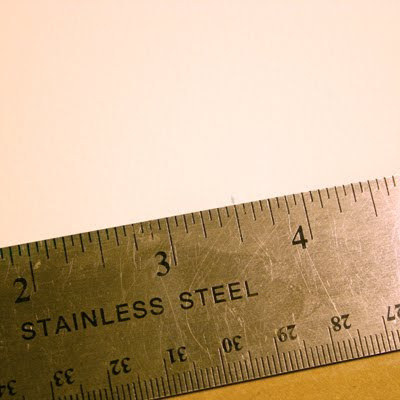 My paper is 7" long, so i marked it at 3.5": Repeat on the top edge then line your ruler up with both the top and bottom marks and very lightly score the paper with your xacto knife. If your blade is new, use a very light hand so you don't go through the paper. Fold the paper in half along the score. 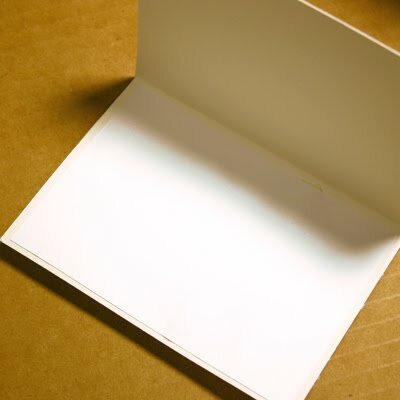 To get it to lay flat, i put a piece of paper over the folded edge and ran the side of a pencil back and forth over it a few times. 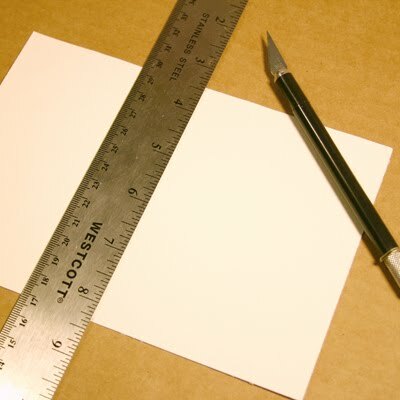 If you have a bone folder for bookbinding, you can certainly use that as well. 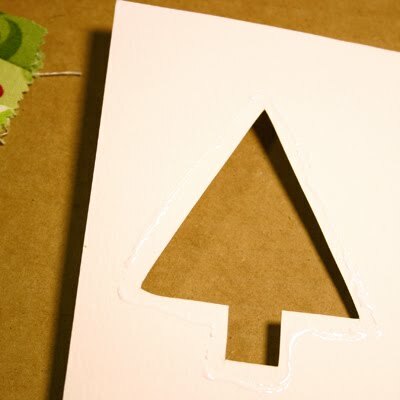 Next, cut out a shape—tree, stars, snowman, etc.— to use as a template. 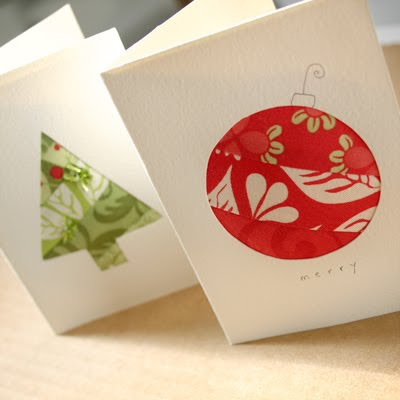 If you want to make an ornament, you can use the bottom of a glass and trace around it for a simple circle shape. 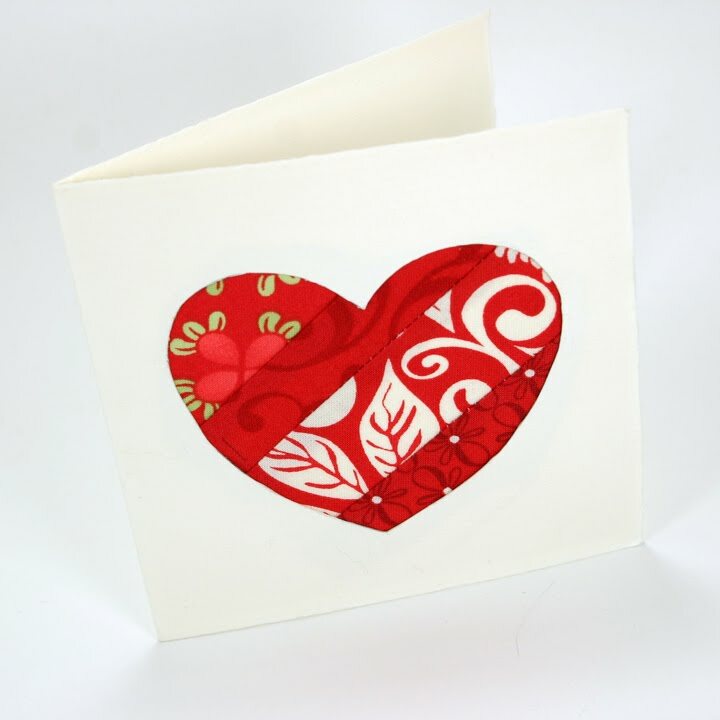 You can also download the ones i made: Very lightly, trace the shape onto the front of your card. 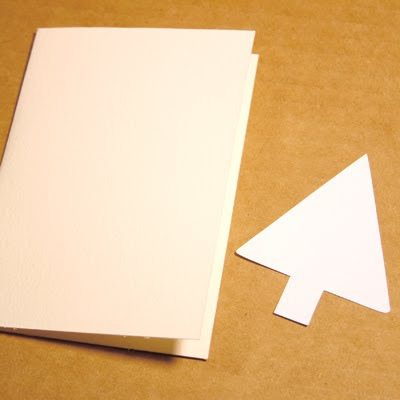 Open your card and lie it flat on a cutting surface then use your xacto knife to cut out the shape: If there are any stray pencil marks on the front, now is a good time to erase them. 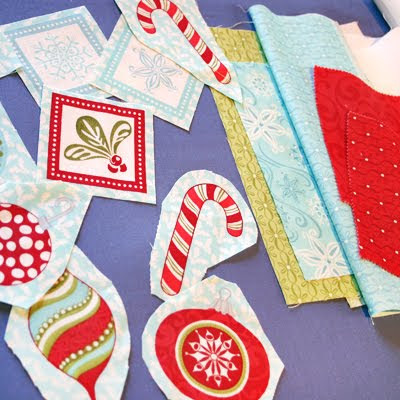 Next, pick out whatever fabric scraps you'd like to use. 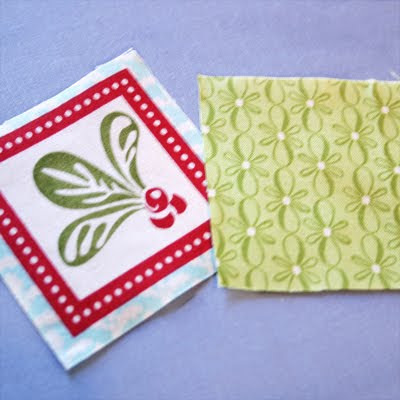 I made sure they were long enough to cover my tree image when positioned diagonally: Sew the fabric strips together. I had strips, you might have squares...doesn't matter, it'll look cute either way! 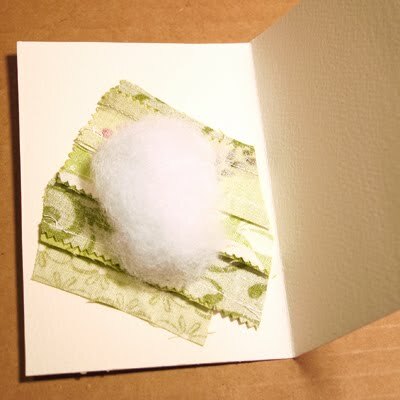 Next, open your card and run a bead of glue 1/4" from the edge of the image. 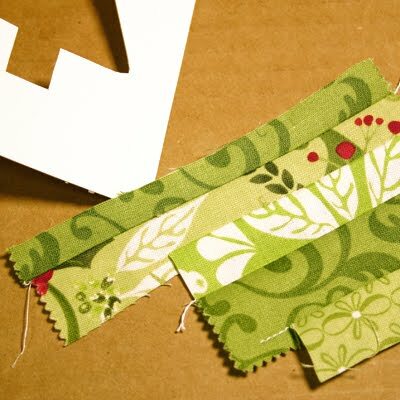 I used the edge of a scrap of paper to pull the bead toward the opening to make sure the fabric would stay put right up to the edge: Position your fabric strips on top of the glue and press in place. 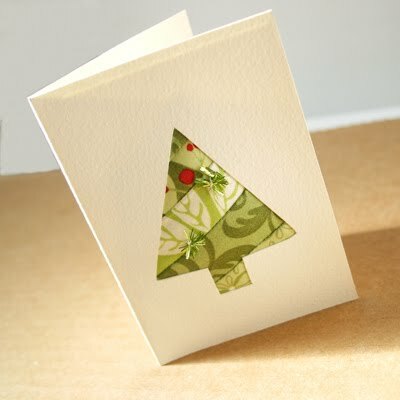 You can also close the card and smooth over the back with your hand. 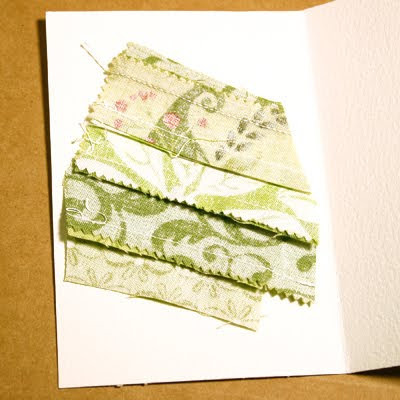 Once you're sure the fabric is stuck on, you can hold your card up to the light to see where the opening is, and trim any excess fabric: This part is optional, but it sure makes the card irresistible! Take a small bit of stuffing and roll it around between the palms of your hands making a little ball. Position it over the fabric you've just glued on. 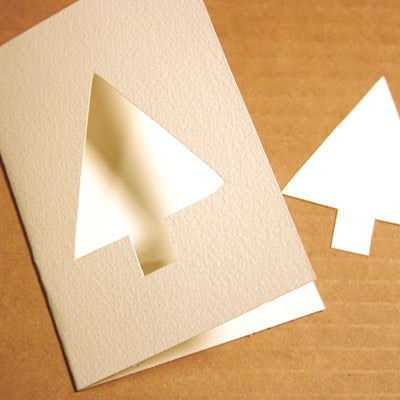 You can kind of smush it around to get it to cover the opening: Take another piece of the same paper you used for the card, and cut it just 1/8" smaller (on all sides) than the inside front of your card. 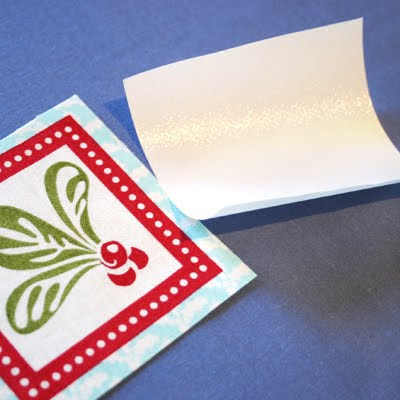 Run a bead of glue 1/4" from the edge and again, use a scrap paper to pull the bead to the very edge of the paper. 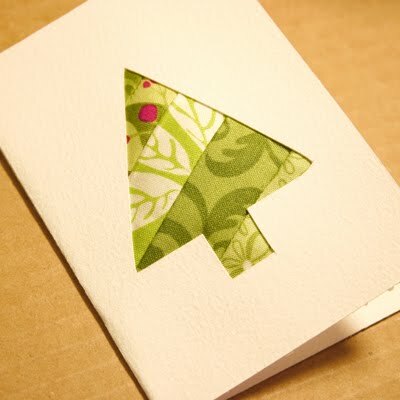 You can also apply glue more liberally to the back in the areas where paper will be glued to paper. In other words, glue can go everywhere but not in the area where the stuffing is (keeps paper smoother). Make sure to smooth out the glue with a scrap piece of paper so it's even and won't buckle and curl too much as it dries: Turn it over...finito! 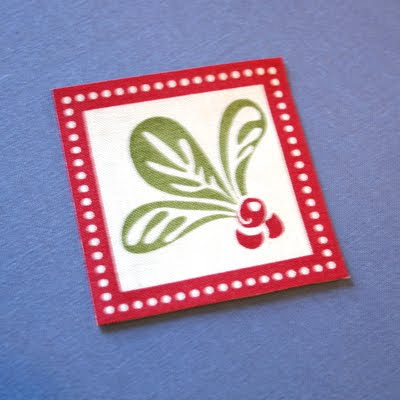 I thought the tree one needed a little extra cuteness, so i stitched on two small green tinsel embellishments — you can see them a little better if you scroll back up to the top picture of the tree card. 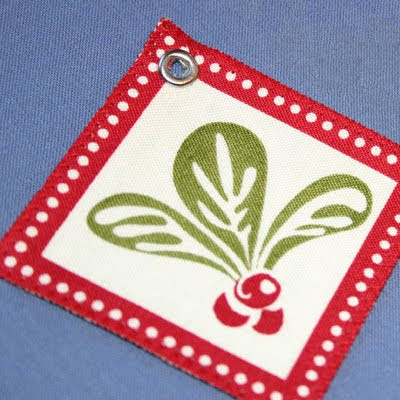 You might want to use sequins or beads or even small ric-rac garland. It's up to you! 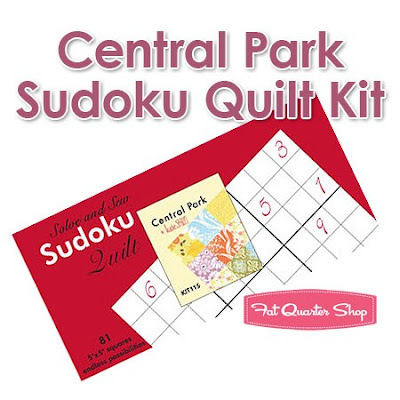 I was also thinking you could take it to your sewing machine and sew a single outline around the whole shape. Here's the ornament one—i drew the top hook, and added the word "merry" to finish it: The stars on the right do not have any stuffing behind them. 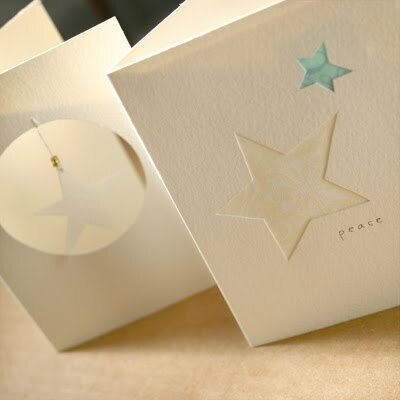 And for the one on the left, i took one of the stars that i had cut out from the one on the right, trimmed it, added two small gold beads to the top and sewed it to the top of the circle diecut so it dangles in the hole: I know there's not too much time left to make cards, so you can always keep these in mind for next year or for other holidays too! The heart one my aunt made would surely be a cute Valentine, or you could do a 4-leaf clover for St. Patty's Day, or a balloon for a birthday...you name it! Have fun! 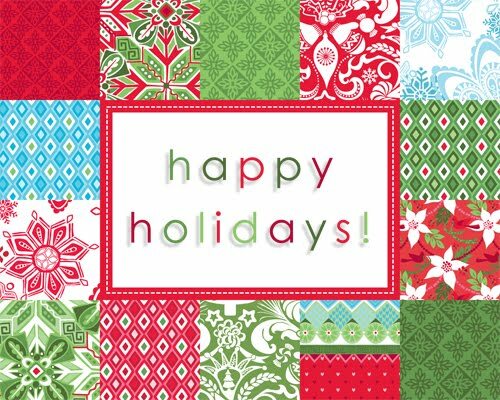 It's been so much fun to spread a little surprise cheer to you this holiday! Thank you all for joining in and for leaving your sweet notes. 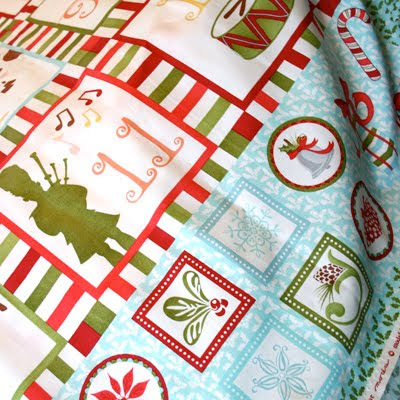 Looks like this one will be headed to a stocking in Ireland! 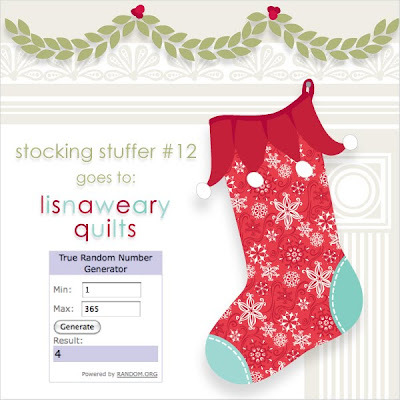 Lisnaweary Quilts, please email me your mailing address and i'll pack up this cutie little surprise and will make sure it gets on the next sleigh! ...and to all a good-night! Just picked another name...congratulations to you, dls! Please email me your mailing address and your package of goodies will be on its way. Yipppeee for you, Sarah! 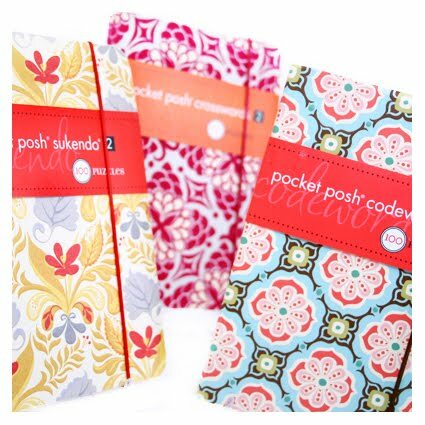 Please zip me your mailing address so i can send this cute bundle of fun off to you! So there are only two more days left for this giveaway. If you haven't entered yet...you still can! Just go back to this post and leave a comment. 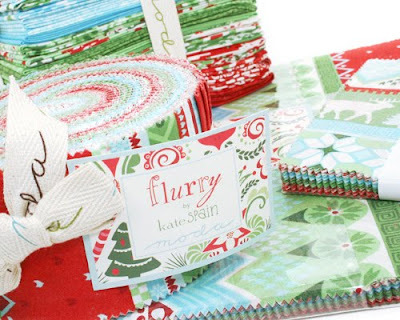 Hey, this morning i heard that the fabulous Melanie over at Above All Fabric received her precuts for Central Park already!! So exciting that they're shipping a little early and just in time to get them under the tree! 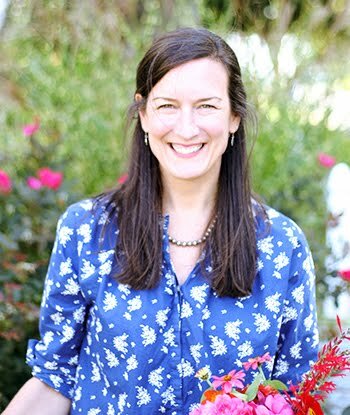 Plus, Melanie is such a sweetie and so generous that she's giving away a jelly roll of Central Park...so go on over and enter to win! 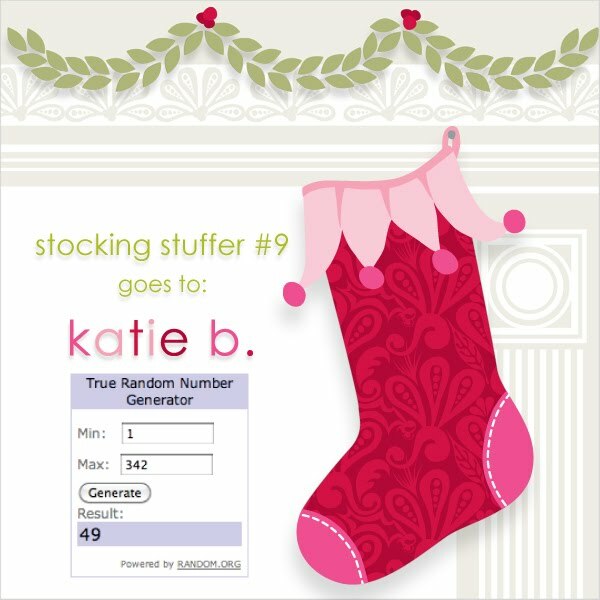 And if you haven't entered my stocking stuffer giveaway, there's still time. But hurry...there are only three more days left. To enter, please go back to this post and leave a comment. In the meantime, is your stocking ready to be stuffed? Or maybe you need to make a new one? Look at this adorable stocking Sherri made using Camille's pattern and 12 Days of Christmas. Too cute! Congratulations! I might just have a little something that your heart desires ;) Couldn't resist. Please email me your mailing address and I'll send it off! Have i mentioned that i've been to the post office more in the last week than i have in the last two months!? Whewieee! I'd do anything for a sleigh and eight tiny reindeer right about now! So, if you're just popping by and are wondering what the hooplah is all about, I've been giving away stocking stuffers to one lucky recipient each day for 12 Days. There are 4 more days for you to enter so please go back to this post and leave a comment. That's all you have to do! And some people have started to get their gifties already! FUN! 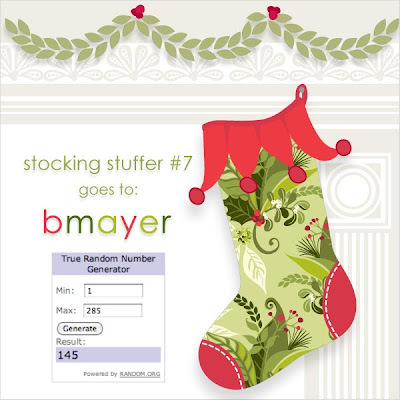 Woohoo to you, bmayer!! Please email me your mailing address, and i'll add your stocking stuffer to the sleigh! This next part is a little repetitive, sorry. I just don't want any newcomers to miss getting in on the fun! 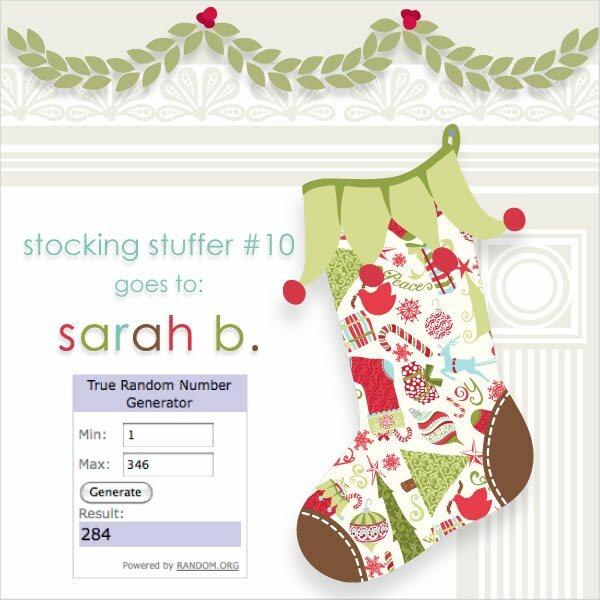 So...if you've just spotted this post and are wondering what the heck is going on...i'm giving away stocking stuffers! A new winner each day for 12 days. Well, we're down to 5 but there's still time for you to enter. All you have to do is go back to this post and leave a note. That's it! Again, if you're just joining us, don't worry! You still have time to enter my 12 Day stocking stuffer giveaway. All you have to do is go back to this post, and leave a note...that's it. A winner a day for the next 6 days! 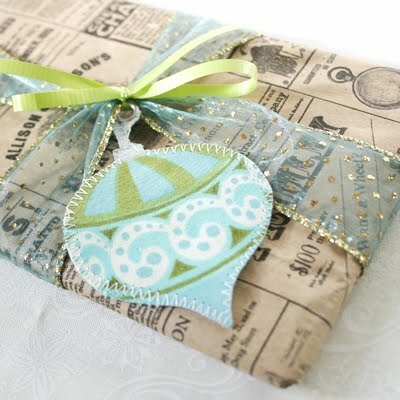 The wrapping paper is flying around my studio as i wrap up so many fun little packages for the winners of my giveaway! 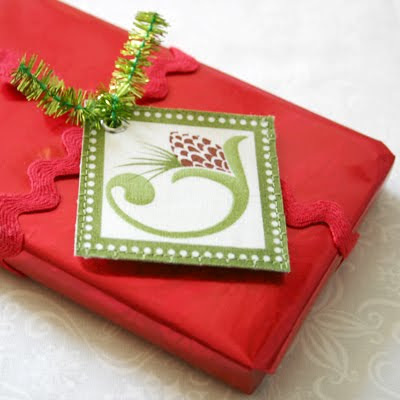 I've been having lots of fun with this and thought i'd share an incredibly quick, ver r r y simple way to embellish your gifts with a cute handmade gift tag like the ones i made in the photos above. I think it took me all of 10 minutes to make one. 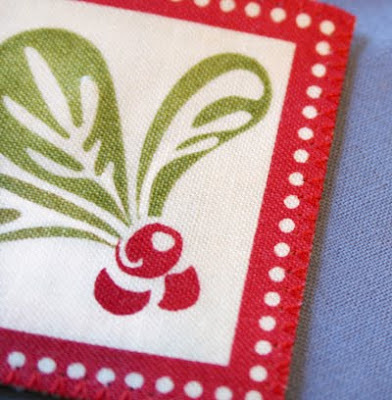 an eyelet tool — i used my handy Crop-A-Dile punch kit. Step 2: Cut a piece of HeatNBond that will be big enough to cover the back of your image or lay your image on top of a piece of HeatNBond and cut through both layers so pieces are approximately the same size. Again, you really don't have to be too precise because we'll trim them to perfection in step 5. Step 6: Kind of hard to see in this pic, but i finished the edges with a zig zag stitch with matching thread. 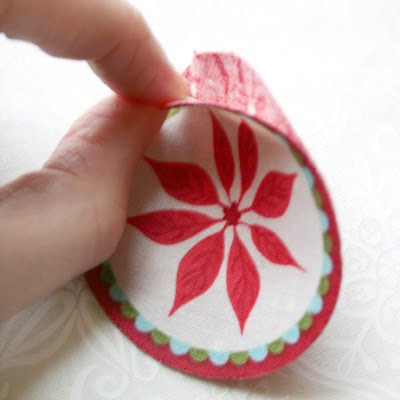 Contrasting thread would be nice too Step 7: Pick a corner and use your eyelet tool to fasten an eyelet Attach to your gift and under the tree it goes! When you get to step 5, only fuse 3/4 of your top image to backing and leave an opening at the top. Trim. 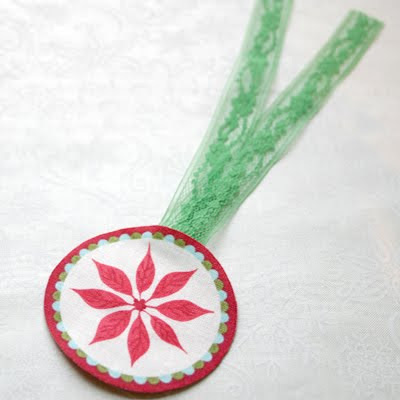 Iron to fuse the layers (this will really only hold the ribbon in place while you sew). 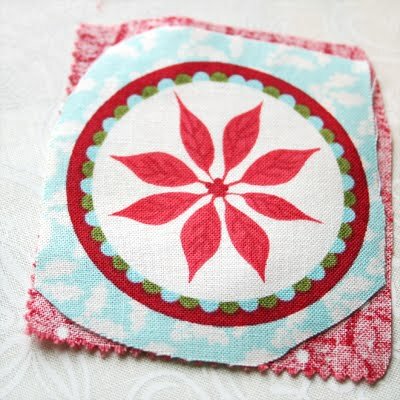 Then sew a zig zag stitch around the outer edge to finish. 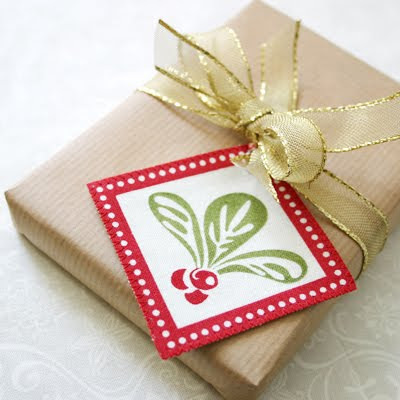 Tie to your gift and give it with joy! Oh, and by the way...all the gifts in these pics will be going out to some of this week's winners! If you haven't already joined the fun, please go back to this post, leave a note and you'll be entered to win. I'll draw another name later on today! 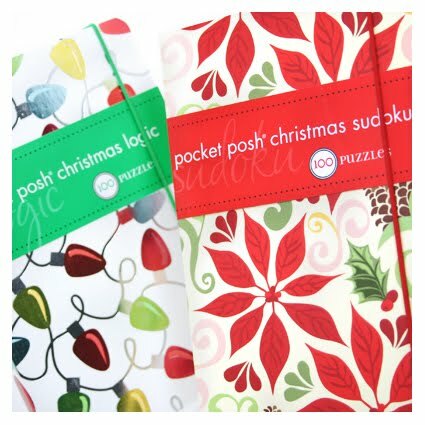 Again, if you're just joining us for my 12 Day-superfun-thank you-mixed-bag-surprise-giveaway-stocking-stuffer-extravaganza, please go back to this post to be entered for a chance to win a little giftie from me! Seven more days to go...don't miss out! And for anyone just hopping in here, I'm giving away stocking stuffers to one person each day for the next 8 days (it was 12, but we're already down to 8)! So, if you'd like to add your name to the pool, please go back to this post and leave a comment. Hope you're all enjoying a lovely weekend! Congrats to you, Jackie! Please email me your mailing address and a surprise will be on its way to you : ) I'm having so much fun putting these little packages together—no wonder Santa is so jolly! I'll be drawing early tomorrow so if you haven't already, please go back to this post and leave a comment to be entered. I'm only drawing names from that post, (too confusing to compile a list otherwise) so if you've left a comment elsewhere don't worry...just go back to said post and leave one there. But please only one entry per person, ok? You still have 9 more days to win something superfunfun! Congratulations to you, Sarah! 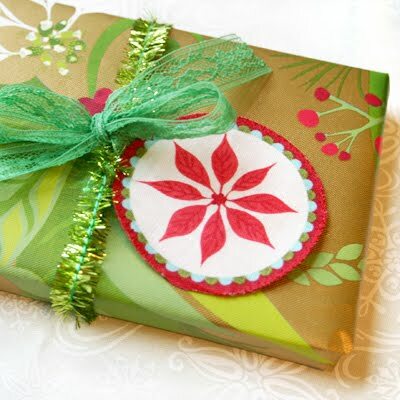 Please email me your mailing address so i can mail the cutie little gift (that i just finished wrapping) to you! It could be YOU, if you go back to this post and leave a comment. I'll be picking a winner a day for the next 10 fun-filled days! 11 days so there's still time to get in on the fun!